You can choose to have InventoryEdge automatically determine which items need to be reordered based on a schedule that you set. If you choose this option, our servers will look at your inventory items' low levels to determine if the items need to be reordered. If an item in one pool is low, the item will show up as ready to be reordered. You would then be able to print a form to send to your suppliers. Click on the Account Setup tab in Inventory and select Setup Batch Reorder. Don’t Generate Batch Reorder: This option will disable the batch reorder. All reordering will then be done manually, as needed. Generate Batch Reorder Daily: Select this option by clicking the bubble next to it. Every day, our servers will look in your inventory and report on what needs to be reordered. You will then be able to print a reorder batch report on a daily basis. Generate Batch Reorder on Below Day(s) of Every Week: Select this option by clicking the bubble next to it and then check the box of the day on which you’d like to have inventory reordered. Every week, our servers will report on what needs to be reordered and you’ll then be able to print a reorder batch report. 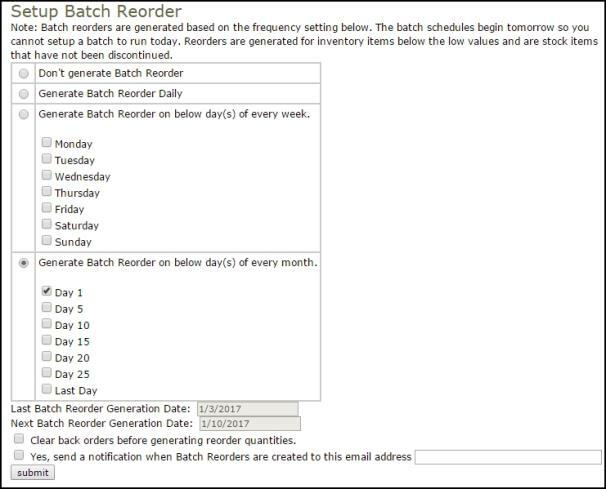 Generate Batch Order on Below Day(s) of Every Month: Select which day or days of each month you’d like to have inventory reordered. Every month, on the specified days, our server will report on what needs to be reordered. You’ll then be able to print a reorder batch report. Check the box next to Clear back orders before generating reorder quantities to ensure that no inventory items on back order appear in the new reorder quantities. If you wish to have an email notification sent to you regarding a batch reorder, check the box next to Yes, send a notification when Batch Reorders are created to this email address. *Note: To add multiple email addresses, enter a semi-colon after each address.